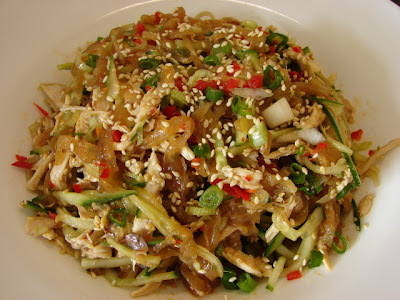 If you've never heard of edible jellyfish or or eaten it before, you probably say eurgh...... For those like me who had it many times in Chinese restaurants you will love this salad. Jellyfish is tasteless. We love it for its crunchy texture. It will absorb any flavour you add to it. 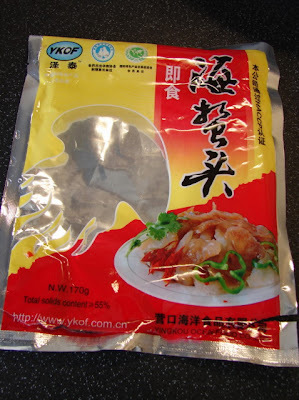 If there is a good Chinese supermarket near you, you can buy the jellyfish and make the salad at home. Traditional jellyfish is preserved in salt or brine, it takes time to soak and de-salt it then it needs to be lightly blanched and shredded. If you are lazy like me, buy the shredded and ready to eat type like this picture below. All you need is rinse and mix with a dressing, I don't use the sachet of flavouring come with the packet. There is also ready to eat jellyfish which has already been flavoured I am not too keen on this. I like to add chicken to jellyfish salad, bulk it up and add flavour to the tasteless jellyfish. Rinse the jellyfish as instructed on the packet, squeeze dry with hands. I throw away the sachet of flavouring. Make the dressing. Add ginger, chilli, 3/4 of spring onion, chilli and sesame seeds. Mix this all together then add the jellyfish. Leave this to marinate for about 10 minutes. Then mix with shredded chicken and cucumber. Sprinkle on remaining spring onion, chilli and sesame seeds. We Foochows love jelly fish which has a strange medicinal benefit : can flush out hair and other fibres...so barbers and hairdressers eat jelly fish at least once a month!! It is a folk belief but my family and I adhere to it ever so often...just in case. Jellyfish flushes out hairs, that's new to me. I was told it's pig's lung soup. Well all these could be folk beliefs! I love the crunchy chewiness of jellyfish - we call them rubber bands when we order it. I will definitely be buying some to make at home.